Also Recommended: Nyarko-san: Another Crawling Chaos, Squid Girl. Notes: Based on a manga series by Keiji Najima, serialized in Weekly Shonen Magazine. Takurō Mukōjima just wants to spend some of his leisure time fishing at the dock in peace and quiet, but he has the misfortune of literally reeling in a mermaid. Her name is Muromi, and she's about to make his life a bit lacking in both of the aforementioned. The competition in the comedy department seems to be heating up at the moment, because I don't think I've seen so many comedies as I've done lately, for both good and bad. The good thing about all of this is that you'll always find something, regardless of where your taste in comedy goes. The bad thing about all of this is that, if you're as fickle with your comedy as I am, it's like playing russian roulette with half a barrel loaded. I have probably ditched at least half of the shows I've been watching lately, mostly because they've given me headaches of various sorts and strenghts. Muromi-san, curiously enough, subscribes to one of my lesser favorites; the hectic, high-octane and severely random gagfest. 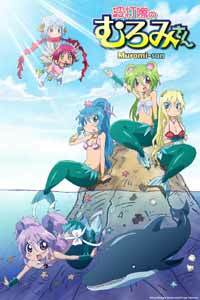 Most of the conversations are told through the language of shouting, and mostly because a lot of the cast -- the mermaids in particular -- are kind of terrible people to various degrees. Muromi herself is violent, a terrible drunk and prone to various outbursts that really showcase her lack of common sense. And of course, the second Takkun (as she so charmingly nicks him) does something nice for her, she latches on to him with romance on her mind. (Hot, steamy romance.) The other mermaids tend to subscribe to lesser admirable traits like violent jealousy, pettiness, vanity, racism and sometimes being pretty unpleasant to have to deal with in general. It's quite telling that the most laidback among the girls to deal with is Levia (affectionally referred to as "Levia-san" by her friends), mostly because she seems quite friendly in general. She can also turn into a giant serpent (as I'm sure her name clued you in on), and is told to have caused the demise of at least one ancient civilisation in ways she tend to refer to as "those were the days". Don't worry, though; they probably had it coming... if those gigantic, laser-spitting robots they built were any indication. Despite all of that, Muromi-san ended up being a lot more entertaining than what I first gave it credit for. This might have something to do with the show having a relatively sizable cast, but not so much as to cause undue confusion by losing track. The episodes also tend to be highly episodic, which prevents the show from becoming stale and dull, relying on run-on jokes to stretch out the runtime. The episode runtime of 12 minutes probably helps in this, keeping a nice balance of briefness that 24 minute shows couldn't possibly replicate, but still feeling a good deal more substantial than web animations of around 2-3 minutes per episode does. Of course, it's all going to depend on how you feel about black humor. Aside from Leviath... er, Levia-san's past... a lot of the humor in general is played off on random cruelty. Muromi is not shy about bringing her bad relationship pasts to the table, and a lot of the issues she has today are basically her taking out her frustrations about what happened in the past. Added to that, misfortunes in general are mostly laughed at by those who didn't experience it, so a lot of the going-downs in Muromi-san will come across as various degrees of mean-spirited by characters portrayed as mean-spirited. It's also going to depend on how you feel about shows making sense. Or not, as is the case just as often. Muromi-san actually points out a lot of facts that sort of make sense from a biological standpoint, but only insofar as it can let loose the hounds of screwery with stuff that will make you scratch your head in sheer confusion. Does it help or doesn't it help when the show also starts mixing folklore into the equation? Because of that, did I just miss any references that might've coaxed some laughs out of me? Who knows? The show itself has this shounenish look to it. As befits something whose manga ran in a shounen magazine, the show mixes cutesy aesthetics with a sharp design style; a far cry from the soft, feminine designs of shoujo. But while the show definitely has its share of fanservice, it's also relatively non-sexual visually, the few sexual jokes there are tend to lean more towards crude than saucy, even going so far as to mock saucy jokes from other shows. The blonde mermaid's large chest serves more as Muromi's punching bags than anything intended to bring male heartrates on the rise (along with... something else), and cutesy attitudes are more often played out for laughs than to get the otaku commnunity going MOEEEEE! The show also has a bit of a rarity in how Levia-san is built like an amazon warrior, with a solid sixpack showing on her stomach; a pretty obvious contrast to the other mermaids' lithe builds. And while backgrounds varies, between bad CG for water and oddly simplistic background art, the animation is generally pretty well done for a TV series. Which is good, given the breakneck speed everything -- dialogue in particular -- moves in. Honestly, I like this show. I don't necessarily like everything in it, though. Given the sheer randomness from episode to episode, we have some misfires, of course, but I guess that's to be expected to some degree. Whether it's between not getting the joke or not really finding it that amusing, the show is on average worth watching. Recommended Audience: The show has the presence of mind to include lots of jokes that makes it inappropriate for kids, but not so bad it needs to be limited to adults only. Most of it are made up of sexual jokes or crass slapstick, but there's also one instance of Muromi having a mushroom-fueled drug marathon with her friends Tiny Female Snake and Kappa Schwarzenegger, only beaten by the mass shroom consumption from volume 3 of the GON manga in sheer insanity. Other than that, though, the show is perfectly innocent.